This post marks two years since our first Design Central workshop in April 2017. Fast forwards to April 2019 and It’s hard to believe that we’ve done over thirty more, covering industries as diverse as viticulture, broadacre cropping, every kind of livestock, soil health, natural capital, circular waste economies, multiple seafood types, native grains, perishables such as fresh fruit and seafood, and even subsistence farming in Africa and ASEAN. We’ve explored technologies such as self-calibrating sensors, models for predicting harvest timing & yields, remote sensing, drones, hyperspectral cameras, mobile phone-powered field test equipment, IoT mesh networks, and even ‘smart bins’. We have evolved our project pipeline dramatically, co-funding over ten exciting projects with our partners. It has been an incredible learning experience. 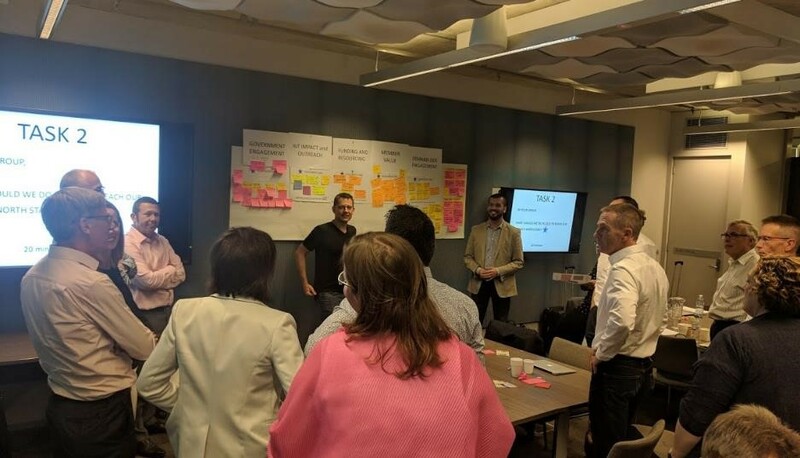 Facilitating our first few workshops back in 2017 was a nerve-wracking experience: a whole day locked in a room of highly-educated academics, powerful business types, and industry representatives employing thousands of people and turning over hundreds of millions of dollars…with only some A3 sheets, sharpie pens and a few post-it notes to make it out alive by 4:30pm! What kept us going through long days of such intense, exhausting work? Our cast-iron belief in the power of end-customer empathy, the resulting ‘Aha! Wow…’ moments from groups of people learning and co-creating together, and the exciting, ground-breaking project ideas which resulted. Along the way, we learned a few critical things to make ‘Design Thinking’ deliver as a workshop method. 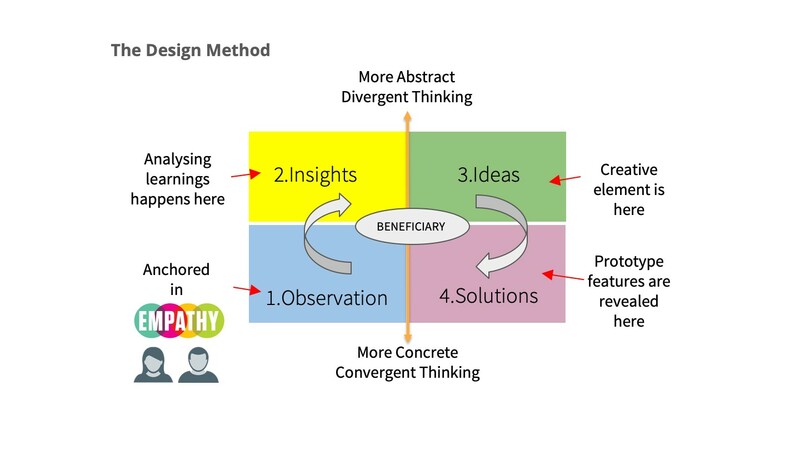 Firstly, we learned that the design process itself involves a series of ‘divergent’ and ‘convergent’ mental processes – see diagram below. The process begins with empathy, an open-minded immersion into the experience of end-customers leading to a ‘divergent’ process of generalising specific learnings into broader thematic areas. We then use these to power the next divergent step: idea-generation, where a range of ideas for the end-solution and/or post-solution state – practical to radical – are driven to emerge. The final creative ‘convergent’ step uses practical, concrete constraints to turn ideas into prototypes to be tested back with end-customers. The second thing we learned is that the empathy step is critical: without it, preconceived ideas and biases can sabotage the workshop. 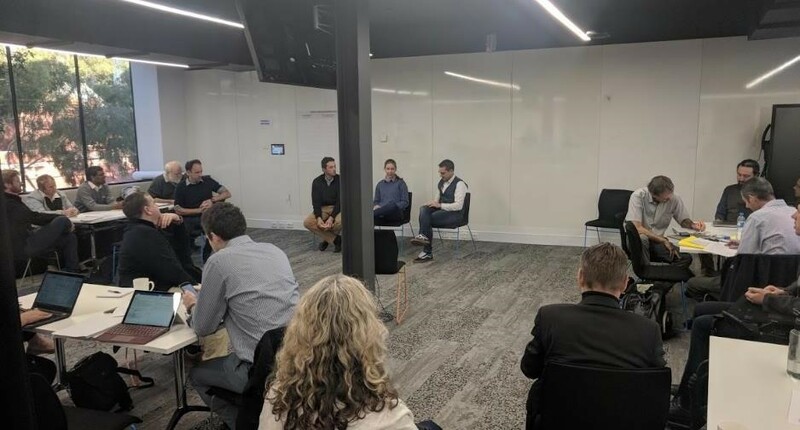 If we’ve chosen our customer well and facilitate a careful, active listening-based Q&A process, priceless learnings can be captured and a shared team mindset created. For example, a commercial Beef Finisher revealed that he saw his role as ”converting millilitres of rainfall into grams of protein”: profound clarify on how to measure project impact. An experienced grower in another workshop exploring perishable fruits reminded us that fruit ripening rates were affected not only by temperature, but also ethylene, a natural ripening chemical emitted by ripening fruit: critical information for the data scientists in the workshop. 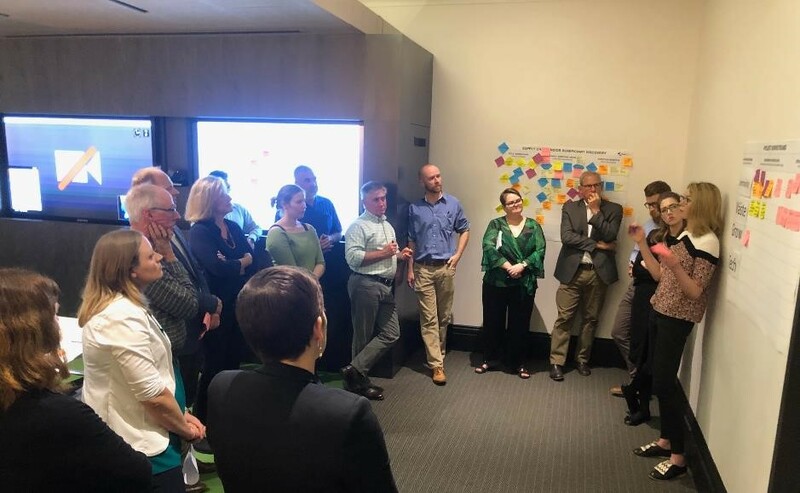 Another key thing we’ve learned is that a set of strong themes – such as ‘sustainability’, ‘policy’, ‘brand Australia’, ‘technology’, ‘data trust’, etc. – are vital to organising the insights gained from the opening customer empathy step, and hence guiding creation of the prototypes which follow the ideation step. Prepared either before the workshop or immediately after the customer empathy step, themes allow us to effectively divide workshop participants into groups of four-to-five, each group working together on a single theme before sharing any learnings and/or creative insights back to the other groups.. This group work process done well can also create ‘psychological safety’, important to fully leverage the diversity and expertise in the room, and release the most amount of linkage-building insights and ideas. 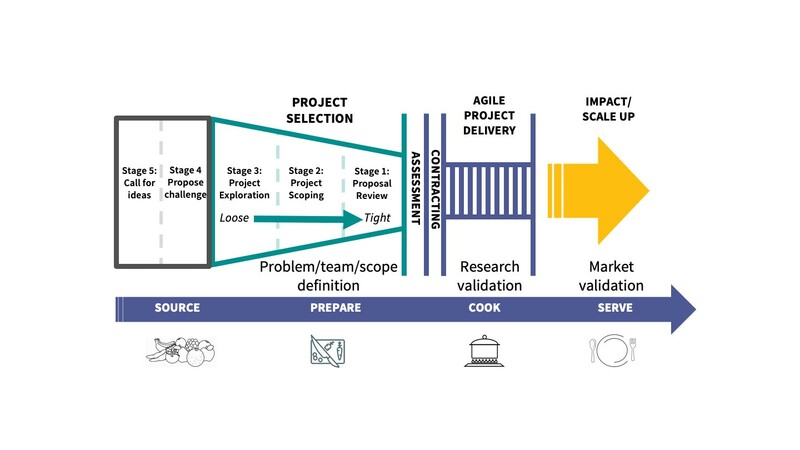 Finally, we discovered that project proposals and teams are often at different stages in evolution, and that we need to be ready to adapt our design workshop process appropriately. For example, if ideas are still formative, a wider-ranging exploratory process is merited. If a project proposal already has a strong, concrete technology pathway, more of a due diligence-focused, risk mitigation approach is warranted. Today, Food Agility’s Design Central workshops form part of an intense crucible of experimental innovation, where we choreograph a collision of people, aspirations, ideas, and knowledge. Our pipeline contains over twenty credible project proposals, following tight on the heels of the ten projects we have already co-funded. The next step on our journey towards a true ‘deliberate innovation’ system is to introduce iterative, agile methods into the post-approval delivery phase of R&D. We are back in the hot seat in this endeavour, and look forward to sharing our thoughts and progress in this space with you very soon.